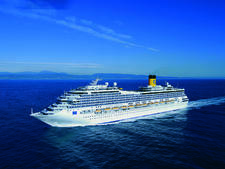 Editor's Note:Costa Romantica had a total redesign and refurbishment in 2014 to be reborn as the Costa neoRomantica, joining fleet mates Costa neoClassica and Costa neoRiviera with a new design that aims to create a more intimate atmosphere aimed at adult-oriented cruising. 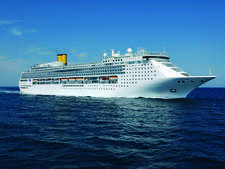 When Costa Romantica was launched way back in 1993, the ship was designed and built for Costa Crociere, then an independently owned Italy-based cruise ship operator. 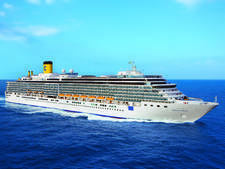 Of course, Costa has since been acquired by Carnival Corporation, and while its newer vessels reflect a decidedly more American sensibility, Costa Romantica has a distinct style of its own. 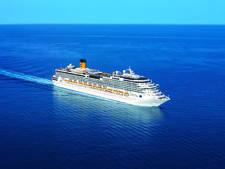 When I first sailed in 1998 aboard Costa Romantica to the Caribbean, I thought it was the most beautiful modern ship I'd ever sailed, reflecting more of a sleek and elegant Milanese style than, say, a rambunctious and frenetic Roman ambience. 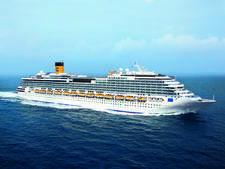 This spring, I headed to the Mediterranean to see how Costa Romantica had evolved over the past eight years. The first observation: One thing that hadn't changed at all was the disorientation you experience when you sail on a cruise that is geared to numerous nationalities. On my cruise there were five languages: Italian, French, English, German and Spanish; sometimes, there are six, when Portuguese is added. 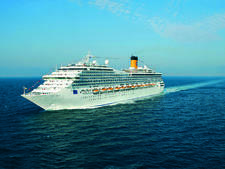 On a previous Costa cruise, the English host gave a cocktail party for Americans early on, so passengers could meet some of the other English-speakers. On this cruise, the English host gave a party for Americans on the penultimate night, too late to help in identifying other English-speakers. There are advantages and disadvantages to such an international passenger base (not to mention crew!). On the plus side, it's educational to be exposed to different customs, cuisines and points of view. On the negative side, people can seem rude. Because they assume most passengers will not understand them, they don't greet others in passing or apologize when appropriate. 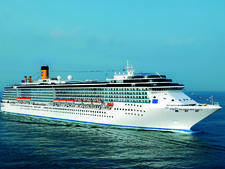 While Italian is the lingua franca of the ship, only Italians speak it onboard; the Filipino crewmembers speak English. Passengers, including myself, have complained to Costa that announcements in multiple languages are tedious (and particularly off-putting to Americans), so there are now few announcements -- too few, actually. There were times when announcements would have been helpful -- for example, when local authorities had cleared the ship and it was time to go ashore. 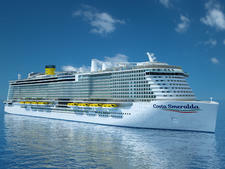 Another change: Since my last visit to a Costa ship in Europe three years ago, smoking has been brought under control. Following Italian law, there is no longer smoking in any dining room, nor at any bar. There is, however, a smoking area in each of the lounges. The smell of cigarette smoke, while present, is nowhere near as pervasive as it once was. 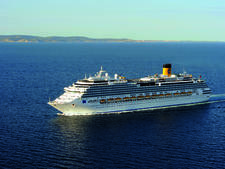 Costa's crew, traditionally drawn largely from its home country, has like most lines in the industry broadened its base with a significant increase in crewmembers hailing from the Philippines. I had heretofore assumed that Filipinos went to sea because, given a limited education, it was the best option open to them. But on this voyage, a steward pointed out the large number of crewmembers with bachelor's degrees -- he had one in marketing. The Philippine economy cannot absorb all its college graduates, so some of them go to sea out of sheer necessity. (My assistant dining room steward told me her sister was studying acting in London and dreamt of being on Broadway.) This results in the topsy turvy scheme of Italian school-leavers (high school drop-outs) ordering around Filipino college graduates. 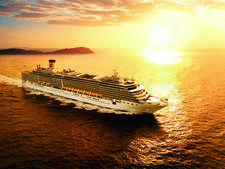 Even though Costa Romantica certainly shows its age -- in the low percentage of balcony cabins, for instance, or fewer recreational or dining options -- I was particularly impressed with its Club Squok program for kids. The children's facilities were, as was typical in the mid 1990's, quite small and cramped. But on my Easter week sailing -- a prime time for European families to cruise as students are on holiday -- the program was so inventive, using various public areas around the ship to complement the limited facilities, that all the urchins seemed well entertained. I came away with my impressions of eight years ago confirmed. Despite some shortcomings, I did like this ship. I like her size, her style and her crew -- and I would return. 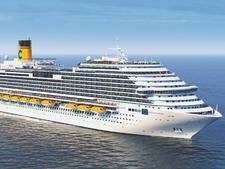 On my European cruise the majority of passengers were Italian, French, German and Spanish. There was, however, an unusually large number of Americans, mostly families from American military bases in Europe, and a large group of English-speaking Filipinos. 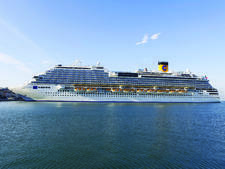 The English host said the average number of English-speaking passengers on a European Costa cruise was 40 - 60; on this cruise there were over 250. The cruise also had the lowest average age of any cruise I've taken. In my late 50's, I'm often among the youngest passengers -- here, I was among the oldest. The average age was only about 35 (certainly an average reduced by the large number of children). There were few identifiable singles. 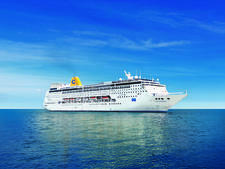 Because of the variety of languages spoken onboard, there were few announcements and none promoting onboard activities. Perhaps it was the low average age, but the dress code was by-and-large ignored. The line printed a suggestion each evening: casual, informal or formal. On formal evenings the dress in the dining room ran the gamut from T-shirts to tuxes, with T-shirts outnumbering tuxes. On formal nights most men wore jackets with no tie; women, short dresses. This isn't a dressy ship, and informality rules. The line asked that no tank-tops or shorts be worn in the dining room at dinner, and I didn't see any adult who failed to comply. In Il Giardino there's no dress code. 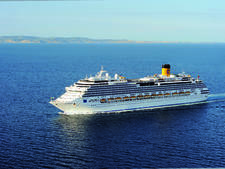 A service charge of 6 euros ($7.20) is added to the onboard account of each passenger, each day. (Half that amount is charged for children under the age of 18.) This amount is divided as follows: 2 euros to the cabin steward(ess), 2 euros to the waiter and assistant waiter, and 2 euros to the staff in Il Giardino. (The English-speaking host informed his passengers that English speakers usually tipped above the service charge, which left an impression that speakers of other languages usually didn't.) A 15 percent service charge is added to bills for beverages and for salon and spa services.